SAMYOUNG Plant can find customers nowdays in Uzbekistan Sand plant, Russia sand plant, Indonesia sand plant, Sri Lanka sand plant, Mongolia sand plant and other place using 250T/H Sand Making Plant. As the one of representative for large capacity sand plants, SAMYOUNG PLANT exports this sand making plant in worldwide. Jaw crusher used to crush as primary crushing, Cone crusher or Impact crusher is for secondary crushing or Tertiary Crushing plant. Size separation of final products is done by Vibrating Screen. 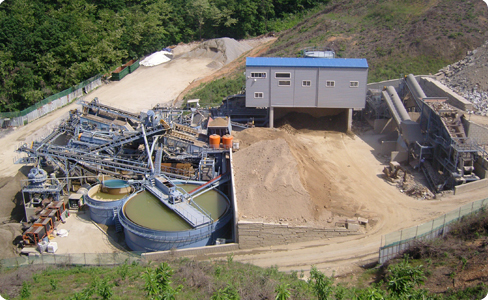 Spiral Classifier and Sand unit (Sand Maker) wash sands with water. Hopper, Vibrating Feeder and belt conveyors are used for transfer crushing materials. Dewatering screen remove the water from wet sands. Stone production line capacity of 200 ~ 250Ton per Hour, Daily Production Capacity 4000T~5000T. 250Ton per Hour Sand Making Plant is designed for using Raw Materials such as basalt, granite, diorite, gabbro, anorthosite, peridotite, sandstone, Limestone, dolomite, flint, etc. Sand Making Plant can provide various size Sand Production Line according to customers' special requirements and hardness of stones. With the wet sand production system, it recycles stone, sand, river and sewer sludge, sand to produce the sand with the production facilities. High degree of automatic operation. High productivity, low investment, and good appreciation. Regular final product granularity, good grain shape, and low powder output.